Listed below you will find some of the horses that have either come out of our breeding program and become successful, horses that we have trained and sold that have gone on to become winners, and horses that we are currently winning on ourselves. If you have a horse that was purchased from our ranch, one that we trained, or one that came out of our breeding program, please feel free to email pictures and your success stories to Amy at rockinas@venturecomm.net. Its Complicated ~ 2008 Bay AQHA mare--AKA "Girlfriend"
Bred & raised by Alexia Mehrle, and owned by Julie Crews of Rising Star, TX, "Girlfriend" is one of the most fun horses we've had come in the barn! "Girlfriend" is a daughter of the #1 Ranked Barrel Racing Sire, Dash Ta Fame! 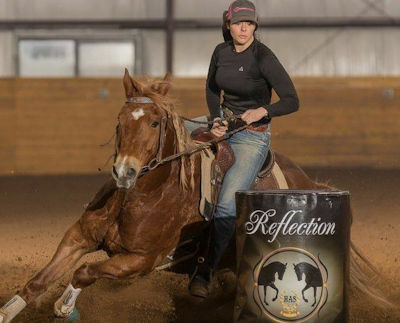 This mare is out of barrel racing producer, Leetta Bug Flit. This is a big, strong, quiet mare with a lot of talent! Three Tymes A Lady ~ 2011 Bay AQHA Mare ~ AKA "Rudy"
Three Tymes A Lady, better known as "Rudy" was purchased by us on the Heritage Place Sale as a 2 year old. She was started under saddle by Rodney Yost and used in his 2014 Horsemanship Demo at the Black Hills Stock Show Rodeo. 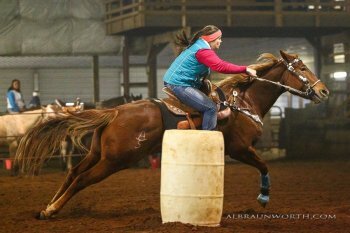 She was trained for barrel racing by Amy Schimke and shown in 2016 by Hilary Van Gerpen & Brett Borkowski. 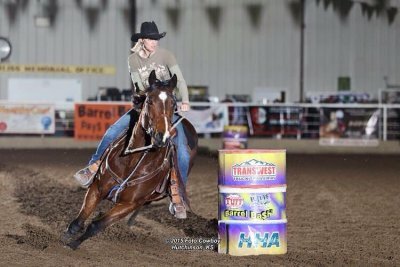 She won and placed at several mounted shooting competitions and barrel futurities and continues to be shown in both events. Frenchmans Moon Dash ~ 2012 Chestnut AQHA mare--AKA "Miss Priss"
Frenchmans Moon Dash. 2012 daughter of Dash Ta Fame out of FC Six French Moons x Frenchmans Guy. We purchased this filly as a 2 year old. 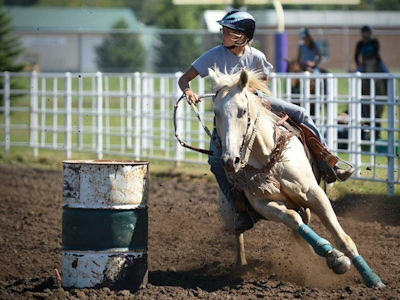 She was started by Rodney Yost and used in his Horsemanship Demonstration at the 2015 Black Hills Stock Show. 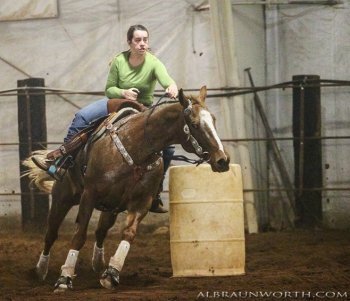 She was trained for barrels by Amy Schimke and is currently winning. She's also a donor mare in our embryo transfer program. Three And Out ~ 2008 Bay AQHA Mare ~ AKA "Three"
We purchased Three And Out as a 3 year old from JM Performance Horses as a broodmare prospect. However Amy took a liking to the mare and decided to try her under saddle. That was probably a good decision, as the mare has gone onto place at several barrel futurities in the 2013 year. She is a BFA Finalist, and has won and placed at several other futurities throughout the year. We are excited about the future career of this athletic mare! Bred by the Fults Ranch of Amarillo, TX, we acquired this mare as a 3 year old coming out of her futurity year as a reined cowhorse. 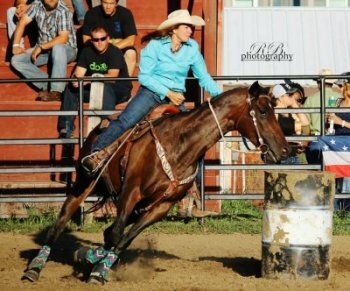 She is our current "go to" horse for any ranch work we need to do on horseback and she's also been a winning mount for Brett in mounted shooting and Amy in the barrel racing. Too Complicated ~ 2013 Bay AQHA Mare ~ AKA "Braimie"
Bred & raised right here at Schimke Ranch and owned by Triple U Quarter Horses of Ardmore, OK, Braimie is a cool daughter of Frostman San Peppy. Her dam is Its Complicated formerly trained & ran by Amy. She's already enjoying a successful barrel futurity career in 2018 winning money at born the Classic Equine Futurity & the Greg Olson Futurity in Buckeye, AZ. Firewater Finale is our junior sire here at Schimke Ranch! He has made a tremendous come-back after a serious accident in July 2009. 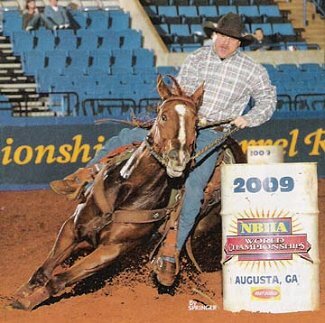 He is running and placing in the 1D at major shows, and has won and placed at several barrel futurities in 2009. This is a 2011 mare that we raised here at the ranch. She was our first attempt at an embryo transfer. She's by Firewater Finale and out of the great barrel mare, Lena May. Bratzilla was a money earner at several barrel futurities and open races for Amy Schimke & Hilary Van Gerpen in 2016. This mare is currently owned by Jean Shultz. Lookit Em Boots ~ 2008 Chestnut Overo Paint Mare ~ AKA "Emma"
Bred and raised by Tim & Beth Sutton of Wagoner, Emma is a daughter of leading Paint race sire, Country Quick Dash, and is out Hero's Valentine, a AAA producing daughter of Texas Hero. Emma had a few starts on the track before we purchased her as a barrel racing prospect from the Sutton's. She took to the barrels right away, and then Brett started shooting on her. 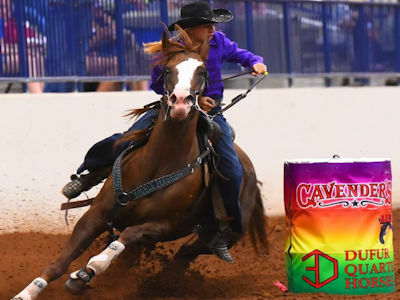 She is a 3D/4D barrel racing horse, but she is running some very competitive times in mounted shooting, oftentimes running some of the fastest times of the events. She is a barrel futurity money earner as well. Emma is one of those horses that you just can climb on and do about anything with. Famous Barbie Doll ~ 2009 Palomino AQHA Mare ~ AKA "Babydoll"
Raised by Barbara Kelley and purchased as a 3 year old from Donnalynn Williams, Famous Barbie Doll is a royally bred mare. She is sired by Dash Ta Fame and is out of a daughter of Fire Water Flit, A Fire In The Sky. A Fire In The Sky is a full sister to Amanda Clayman's NFR mare, Fire Water Fanny. Babydoll was started on barrels and almost immediately was clocking 1D and 2D times in the spring of 2013. Unfortunately she was injured in June, and had to be laid off most of the summer of 2013. Watch for her in the fall of 2013 and in the 2014 Derbys. Here is a video of the last run I made on her the day before she was injured. Milliondollar Secret ~ 2005 Chestnut AQHA mare ~ AKA "Midol"
Midol is one of the most versatile horses on our ranch. 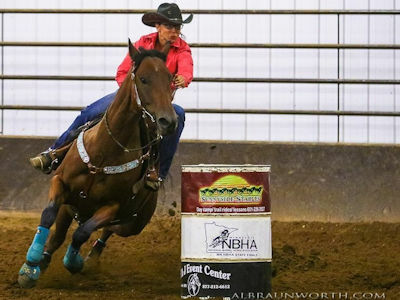 She ran AAA on the track as a 2 year old, raised a foal as a 4 year old, and was a barrel futurity champion and finalist at several large 2010 barrel racing futurities for Amy Schimke, before being started by Brett Borkowski on mounted shooting. 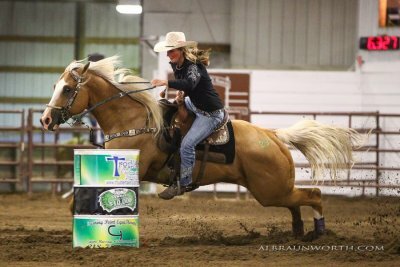 She has done well at several mounted shooting jackpots, and won the AA Double Down at the 2011 Will Lantis Classic CMSA event. Consequently, that was her first ever CMSA event. Brett has plans to season her further as a shooting horse and we are also doing some embryo transfers out of her, to keep her genetics going while she is being used in competition. 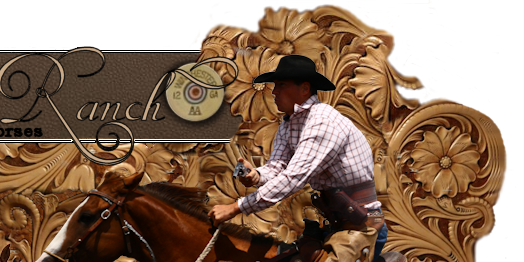 Great Guns On Dakota ~ 2007 buckskin AQHA gelding ~ AKA "Gunner"
Bred & raised by Rodney and Connie VanGerpen from Avon, SD and trained/shown by their daughter Hilary VanGerpen, Gunner has a list of wins too long to list here! Gunner is a son of our stallion, Frostman San Peppy, and is out of VanGerpen's mare, Smokys Conquest. Gunner has won and placed at several barrel futurities in 2012, he has won and placed at pro and amateur rodeos, he's a consistent 1D barrel horse at the open races, and he is a derby champion. He is also an excellent heading horse! Hilary has done a great job with this athletic gelding and we are proud of her accomplishments with Gunner! Owned and trained by Amy Schimke. Money winner at several 2007 barrel futurities including Bold Heart Barrel Futurity, MN Lakes Barrel Futurity, Heartland Barrel Futurity, and was the 2007 Midwest Futurity Finale Champion. 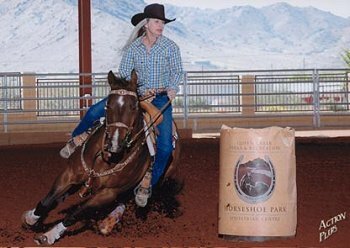 Multiple Derby winner in 2008, and also the 2008 WPRA World Finals ProDerby Champion. Lena May was the #2 Ranked Open 1D horse in the North Central Region in 2008, and was one of the top 15 Derby horses in the world, according to EquiStat. 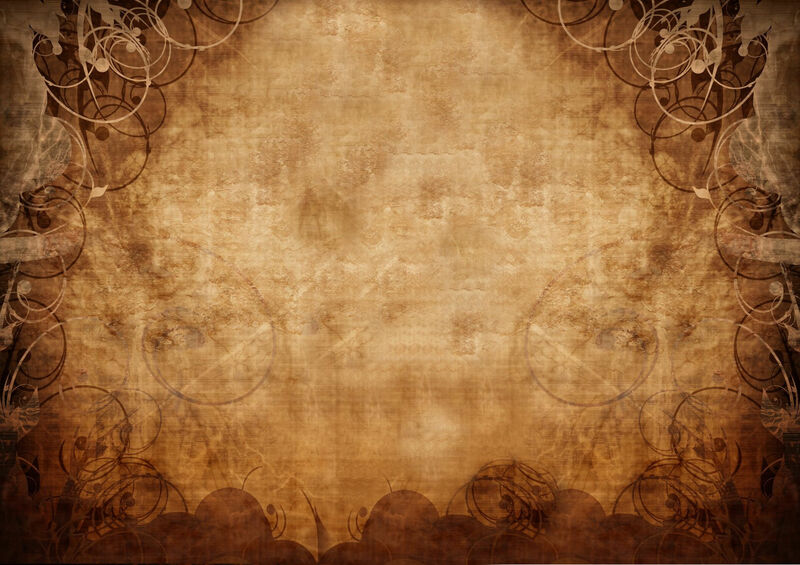 Badlands Circuit Top 15 in 2008 and 2009, won and placed at some of the biggest PRCA rodeos in the nation including Cheyenne Frontier Days and Guymon Pioneer Days rodeos. UUU Bearpaw McGraw ~ 2006 Black AQHA Gelding ~ AKA "Rio"
2006 gelding by our senior stallion, Frostman San Peppy, and out of a foundation race bred mare. "Rio" was bred and raised by Shari Amiotte of the Triple U Ranch north of Fort Pierre, SD and trained for mounted shooting by Brett Borkowski. The first blank was fired off of him in February 2011 and by July of 2011 he was already placing in the money at several CMSA events in the rifle classes. He was also Brett's 2011 futurity horse at the Western Shooting Horse Futurity in Clovis, NM where he placed 2nd behind Chad Little. 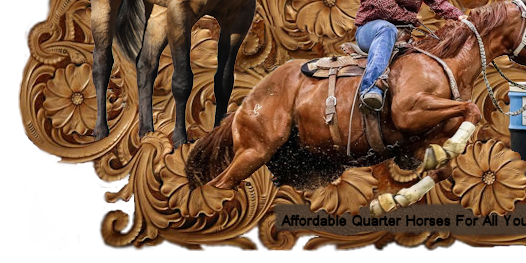 Rio is a smooth moving, easy-to-ride gelding that truly enjoys mounted shooting competition. Trained for Bruce Eilers by Amy Schimke. Money winner at several barrel futurities in 2007 including the Big Bang Barrel Futurity, Iowa Hawki Barrel Futurity, Bold Heart Barrel Futurity, MN Lakes Barrel Futurity, Heartland Barrel Futurity. Also was Reserve Champion at the 2007 Midwest Futurity Finale and was featured in the February 2008 issue of the Barrel Horse News. Tia is currently winning for her new owner Krissy Knauf of Wisconsin! One Sharp Floozie, better known as "Lucy", placed at several barrel racing futurities in 2008 including the Roper Rally Futurity, the Iowa Hawki Futurity, the WPRA World Finals ProFuturity, and the Northern Region Futurity Tour Finale. She won both the Bold Heart Open Barrel Futurity and the Minnesota Lakes Open Barrel Futurity, and was a short go qualifier at the WPRA ProFuturity in Tulsa, OK. She is currently owned and being won on by Jean Shultz, of Wessington Springs, SD. Frostman San Peppy x Flicka Bruce by Doc Bruce. Money winner at several barrel futurities in 2007 including Big Bang Barrel Futurity, Iowa Hawki Barrel Futurity, and Bold Heart Barrel Futurity. Reserve champion shooting horse at the 2007 Spirit of the West CMSA Match. Competed at the 2007 CMSA World Championships in Las Vegas, Nevada. Reggies Bully ~ 2007 Bay ApHC Mare-- AKA "Peanut"
We purchased Peanut a barrel prospect from Frank Cooper as a 3 year old. She was in race training with Frankie but never had an official out. Peanut is a daughter of Bully Bullion out of an ApHC daughter of Check The Charts. Trained by Amy Schimke, Peanut is a consistent 1D and 2D horse and a barrel futurity money winner. She was sold to Jean Shultz in the fall of 2012 and Jean has been doing very well on her. Jean won the 2012 SD NBHA Finals Senior 2D on her as well as the 2012 SD NBHA Finals Open 3D on her as well, with limited runs under their belt. Here is a mare that is just too great to retire. Flicka Bruce.....aka "Goldie".....by Doc Bruce out of Light Flicka Lex, Amy ran her in high school and college rodeos, and went on to fill her WPRA permit on this great mare. Since then Goldie has gone on to help a couple of other young girls learn the ropes of barrel racing and rodeos, and has raised a few foals in between. Goldie is the dam of Brett's shooting horse, First Flicka Frost, and is also the dam of a barrel gelding currently owned and shown by Dan Enberg of Wisconsin. She has a 2008 foal by Firewater Finale currently owned by the Jandreau family of Kennebec, SD. Most recently, at the age of 24, she has been used as a mounted shooting horse by Brett Borkowski. She was reserve champion overall mens shooter at the 2009 Will Lantis Memorial Shoot in Spearfish, SD, and was also the overall Men's Champion shooting horse at the 2009 Geddes Fur Trader Days Grand American shoot. 2010 palomino daughter of Frenchmans Guy out of the great DTF daughter, Paris Model Of Fame. She was bred and raised by leading breeder, Donnalynn Williams in Texas, we purchased "Pretty Girl" as a long yearling. 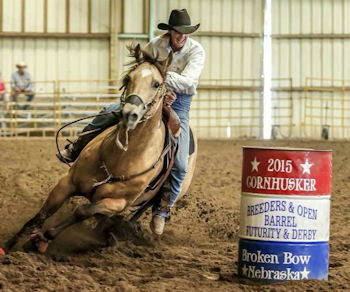 She was started under saddle by Rodney Yost and trained for barrels by Amy Schimke. She placed at several 2015 barrel futurities and was a 5 State Breeders Futurity Finalist. She's currently owned by Jessie Huebner of Wisconsin. 2011 Bay daughter of Tres Seis that we purchased as a 3 year old at the Heritage Place Sale. "IKnow" was sent to Rodney Yost for basics, then started on barrels by Amy Schimke. She is currently owned by Renae Smith of North Dakota. 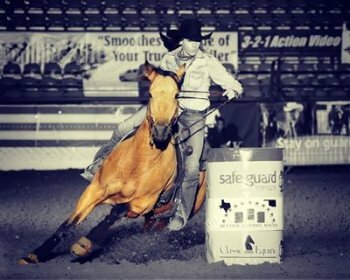 She was ridden by Samantha Flannery at the 2016 barrel futurities, where she was a money earner in very tough competition. We purchased this gray 2010 daughter of Tres Seis as a 3 year old on the Heritage Place Sale. She was sent from the sale to Rodney Yost and she got some basics put on her out there. 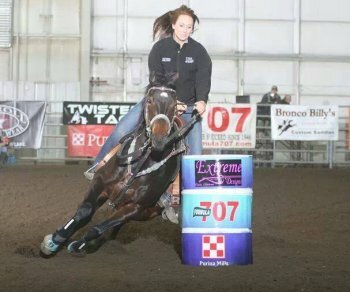 She was trained for barrels by Amy Schimke, but was sold to Julie Crews in Texas before her futurity career got started. She's been a winner for Julie under jockeys Sage Vincent and Kinsey Chandler. She's raising some nice foals via embryo transfer, too. Runnin Moonshine is by Firewater Finale and out of Willow Wisp Moon x Runnerelse. This mare was raised and trained by Brittany Pozzi. She had a successful futurity career with Brittany and is now winning for her owner, Rylan Heller, in tough Texas competition. Wrangler Rock It was bred here, but we sold her in utero with her dam, to the Bene family in Arizona. She's by Firewater Finale and out of Three Forty Nine x Rocket Wrangler. Suzann Bene has been the trainer and jockey on this nice mare. She did very well at the futurities and is still running tough in AZ. Sired by JK Copper Bruce, out of JK Tia Pepper. 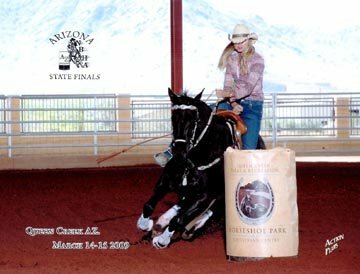 Originally owned and started on barrels by Amy Schimke, now owned by and currently being won on by Debbie Ball of Arizona. Sired by Docs Laughing Boy. 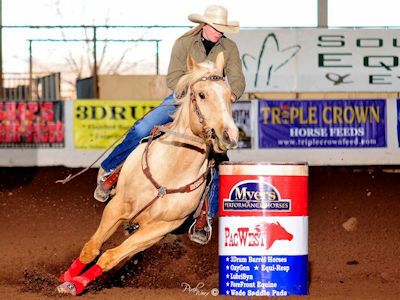 Originally owned and started on barrels by Amy Schimke, finished out by (and now winning for) Laura Biggs, of Maricopa, AZ. Sired by Perkin Chief, out of Pacs Lois Magnolia, by Pacific Bailey. This mare was raised by Amy Schimke and sold as a 2 year old off of our ranch website! She is currently being ridden by Don "Ducky" Keller and is winning some pretty big titles! 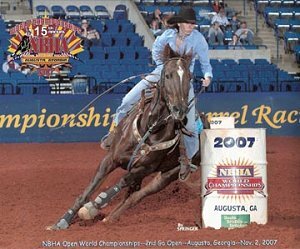 She was the 2009 Southern States Triple Crown Slot Race Champion, as well as the 2009 NBHA WORLD CHAMPION OPEN 2D barrel horse! Congratulations to Missy and all of her connections! It pays to ride a Schimke horse!!!! Purchased by Schimke Ranch as a yearling, and started by Amy Schimke, Bold And Famous was sold to Cody & Renae Smith in 2013, and was finished & jockeyed by Samantha Flannery to several futurity and open 1D wins in 2014. They made the short round at several major barrel racing futurities including Diamonds And Dirt, Fizz Bomb, BBR Futurity, and won the 2014 Dash & Dance Futurity. 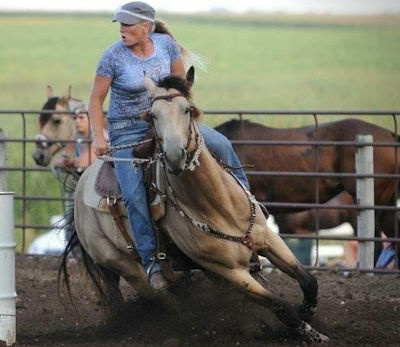 She was also a Semi Finals qualifier for The American Rodeo. We have a 2013 filly out of this mare, via embryo transfer, currently in training. Casandra Kleinjan and Runnin For Firewater, a daughter of Firewater Finale out of Willow Wisp Moon x Runnerelse. 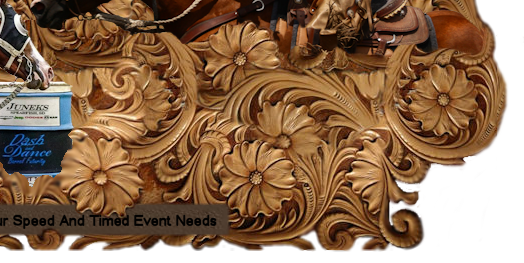 This mare placed at several barrel racing futurities & shows in Minnesota and surrounding states, in 2014. 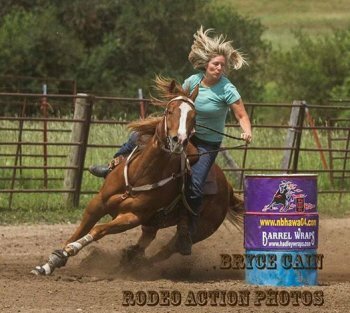 Cheryl Wallace making a winning run and earning a Bonus Race Qualifier at the 2015 Hutchinson KS Barrel Bash. JMS Frostbug was raised by Schimke Ranch and sold to the Wallace's as a weanling. He is by Frostman San Peppy and out of KR Jean Bug by Blushing Bug. Tough Little Flit is a buckskin mare from Firewater Finale's first foal crop. Her dam is JK Tia Pepper, a half sister to NFR qualifier, SX Docs Slider. This filly was raised by Schimke Ranch and sold to Texas as a weanling. She was then purchased by Danika Kent, and has been successful at the rodeos and open 4D barrel races in Texas. 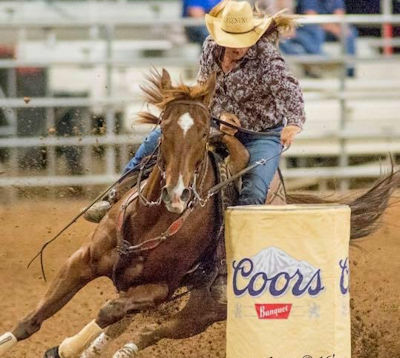 Cashs Rosie is a race winning daughter of Troubled Memories, that was purchased by Schimke Ranch, from Frank Cooper, and started on the barrels by Amy Schimke. She had one foal, and was sold to Hannah Koch, of Litchfield, MN after foaling. Hannah brought her back and finished her out after the foal was weaned, and she has been a solid 1D and 2D barrel mare for both Hannah and her sister, Elana, who is pictured in the saddle in this photograph. Request Te Firewater was bred & raised by Schimke Ranch, and sold as a 3 month old baby to Hannah Koch, from Litchfield, MN. Hannah did a great job of growing this filly up and training her for barrels herself. She did very well at the 2014 barrel racing futurities and open races with extremely limited hauling. Request Te Firewater is by Firewater Finale and is out of a stakes winning, stakes producing daughter of Cash On Request. Frenchmans Lil Star was raised & trained by Hilary Van Gerpen. She was an accomplished roping and barrel horse. She is sired by our stallion, Frostman San Peppy, and is out of Hilary's good 1D producing mare, Smokys Conquest. Juliette Wheeler now owns this mare and has been doing very well on her at the barrel races. Okay Katy was a daughter of Dash Ta Fame purchased by Schimke Ranch as a well broke 4 year old. She was started on barrels & mounted shooting here by Brett, and was sold to Cody & Renae Smith in the winter of 2013. Renae did very well in the 2013 futurities and has been having a lot of success with Katy at the rodeos and barrel races up in North Dakota the last couple of years. Pacific Frostman was bred and raised by us. He is sired by our stallion, Frostman San Peppy, and is out of the late Pacs Lois Magnolia. "Buzz" won the 1D in the first go of the Rapid City, SD Barrel Bash. He placed at the 2010 Bold Heart Barrel Futurity, and he won the first two long rounds, and placed 2nd in the average at the 5 State Breeders Barrel Futurity in Rapid City, SD. Buzz is owned by Wallace Quarter Horses, of Broken Bow, NE, and has been ridden by Rose Hildebrandt. Photo of Cheryl Wallace and "Buzz". Here is a photo of Kristy Maxwell competing at the 2007 NBHA World Finals in Augusta, on Bailey Magnolia. Bailey Magnolia was purchased from us by the Maxwells as a weanling. Bailey Magnolia is sired by our old stallion Oh Magnolia and is out of Naturally Pacific by Pacific Bailey. Rebecca Rose and Hez Sippin Firewater. 1D/rodeo winning gelding by FIREWATER FINALE out of Sheza Mystery Te. Flash Of Firewater, 2008 mare by Firewater Finale out of Flame Flash x Doc Bruce. We bred this mare and sold her as a weanling. Laura Julkowski, pictured, was the Open 1D Champion at the 2016 Minnesota State NBHA Championships on this mare. Firin For Bullion, 2012 gelding by Firewater Finale, out of Lena May. Bred and raised by us, sold as a weanling. Trained and jockeyed by Hilary Van Gerpen and currently placing at 2017 futurities and open races! JMS French Effort aka "Diago"
JMS French Effort aka "Diago" was bred by us and sold as a weanling. He's a son of Frostman San Peppy and out of a AAA daughter of Special Effort. He stood briefly at stud in Minnesota, but we got him back the spring of his 5 year old year, and gelded him before sending him to Hilary Van Gerpen for barrel training. Hilary got him running very well and he was sold to the Aamot family of DeSmet, SD. Anne Aamot is pictured here making a nice run on him at a local jackpot. Diago also works cattle full time on their farm when he's not barrel racing. Check This Flit Out. We raised this palomino gelding by Firewater Finale and out of Honey Check Me Out x Check Him Out. Young Callie Aamot picked him out in the pasture when he was about 2 weeks old. Callie has done very well with "Spirit" at the 4-H rodeos and she even won some 2D futurity money on him in 2016! It'll be fun to continue watching these 2 youngsters grow up together. A Shot Of Firewater was the first Firewater Finale baby to ever hit the ground. He's a breeding stock paint, out of Dial Judy x Judy's Lineage. We bred this colt and sold him as a weanling. 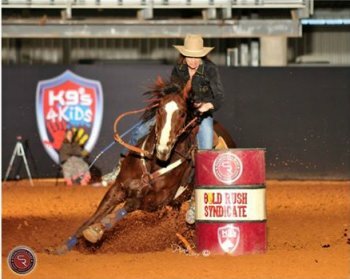 He's owned by Tracy Brown, but this photo is of Kelsie Clutts making a run on him.